I've always been fascinated with cicadas - the aesthetics, acoustics, behaviors and transitions as well as the ubiquitous audio contribution to Summers in the Midwest. Since 2007, when I realized there was a wealth of information online and the chance to actually contribute to the body of knowledge on these critters, I've photographed and video recorded many species, none more interesting than the seven known species that belong to the genus Magicicada - the periodical cicadas. 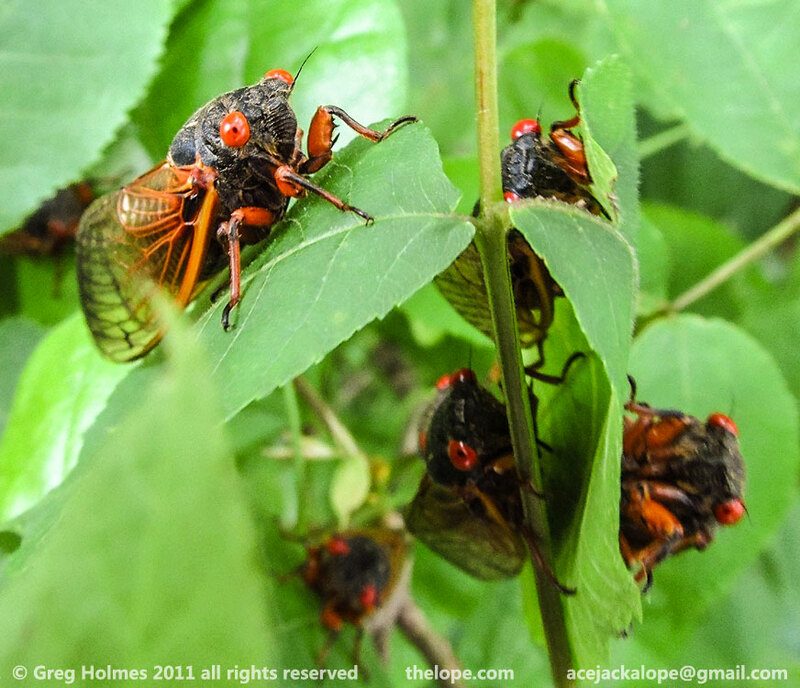 Periodical cicadas are grouped into Broods - huge populations that emerge every 13 or 17 years in a specific region. These broods fit together somewhat like a jigsaw puzzle, missing or overlapping only slightly as they cover most of the eastern half of the U.S. In 2011, I leapt into Brood XIX to gather photos, video and some locational info to help map their range - an effort interrupted by the Joplin tornado. In 2014 and 2015, I drove thousands of miles with an onboard computer and GPS to help map the ranges of Broods III, IV and XXIII for magicicada.org, shooting images when I could. Here's a gallery. Enjoy, but if you want to use something, contact me. And please consider being part of the mapping effort by reporting what you see in the field to magicicada.org. 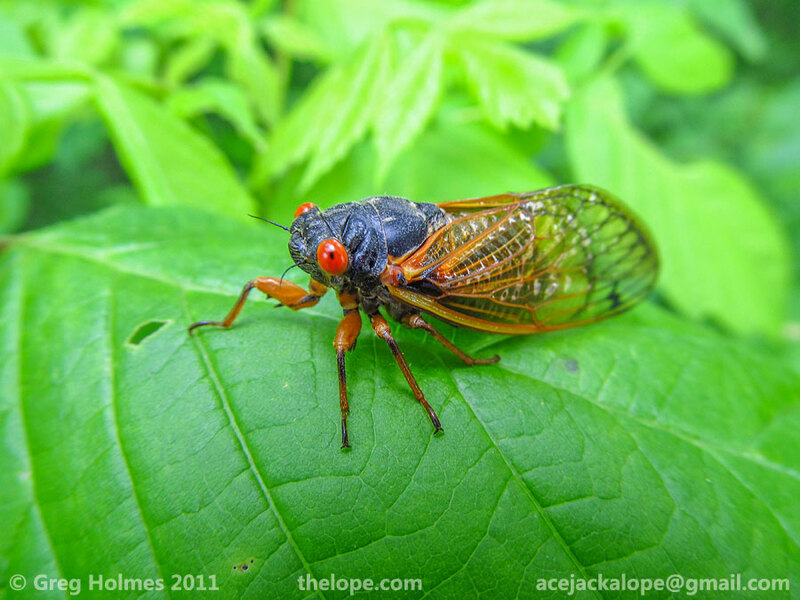 A Magicicada tredecassini periodical cicada of Brood XIX (13-yr) rests on a leaf in Buffalo City, Arkansas, on May 15, 2011. Note that it is black with red eyes. This is the general appearance of all seven known species, though very rarely, the eyes are not red. 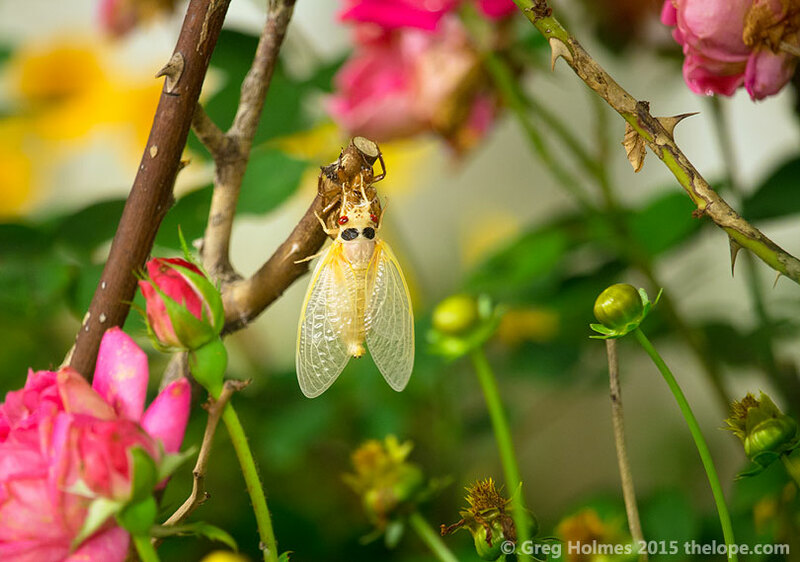 These are not to be confused with the annual cicadas, which are usually green or some sort of Earth tone camouflage and come up every year (amount varies) in most areas they inhabit. 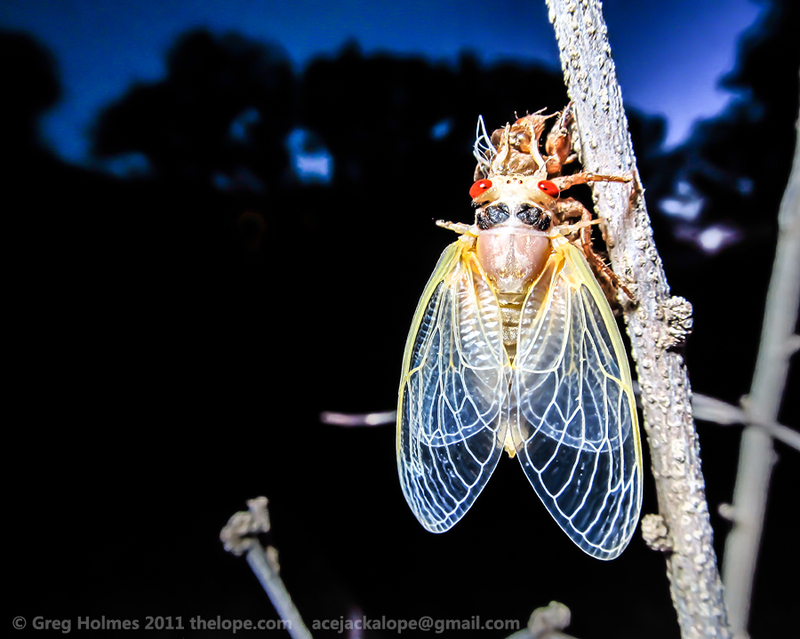 A Magicicada tredecassini periodical cicada of Brood XIX (13-yr) dries and hardens after molting in Buffalo City, Arkansas on May 14, 2011. When finished, the cicada's light body will be mostly black. Entomologists call the process of shedding the skin "ecdysis;" for simplicity's sake, I'll call it by the more general but accurate term, "molting." 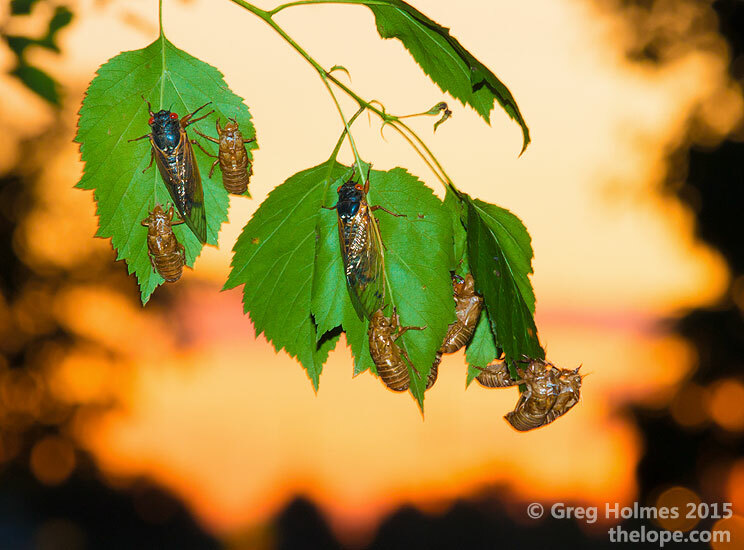 A group of Magicicada tredecassini periodical cicadas of Brood XIX (13-yr) rests in underbrush the night after molting in Buffalo City, Arkansas on May 14, 2011. One of the remarkable things about Magicicada is that they emerge in overwhelming numbers - as many as one million per acre. 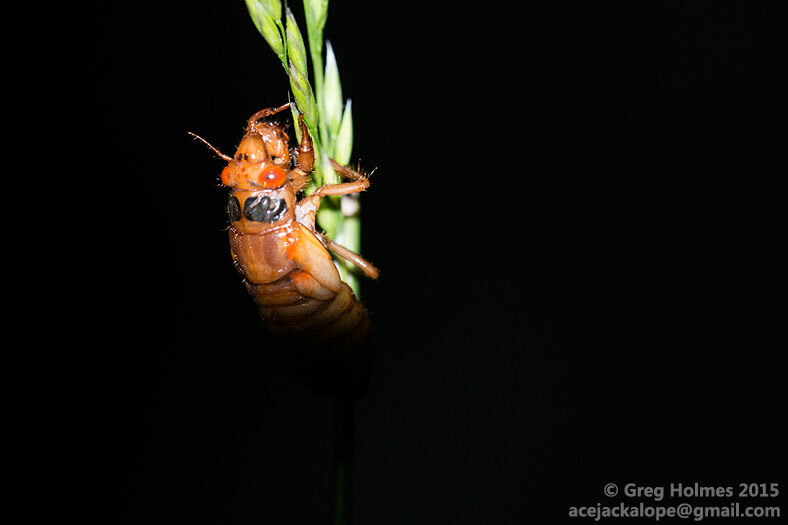 This survival strategy is called "predator satiation" and means just what it sounds like - there are so many that predators can eat their fill and there'll be enough Magicicada to continue the next generation. Like all cicadas, Magicicada start as nymphs. In their case, they have been underground for almost 13 or 17 years, going through several sheddings of the cuticle (the brown shell left behind) as they grow. It is the fifth form - a "fifth instar" that crawls out of the ground when the time is right, which is thought to be when the temperature in its burrow is 64°, eight inches down. With so many nymphs emerging at once, real estate is sometimes at a premium. See two nymphs tussle. Magicicada neotredecim of Brood XIX (13 yr) calls in captivity. This species was only recently discovered - in 1998 by David Marshall and John Cooley. Previously it had been thought a variation of Magicicada tredecim. Male Magicicada use sound organs called tymbals. Here's a Magicicada tredecim making an alarm call. You can see the white tymbals vibrating. 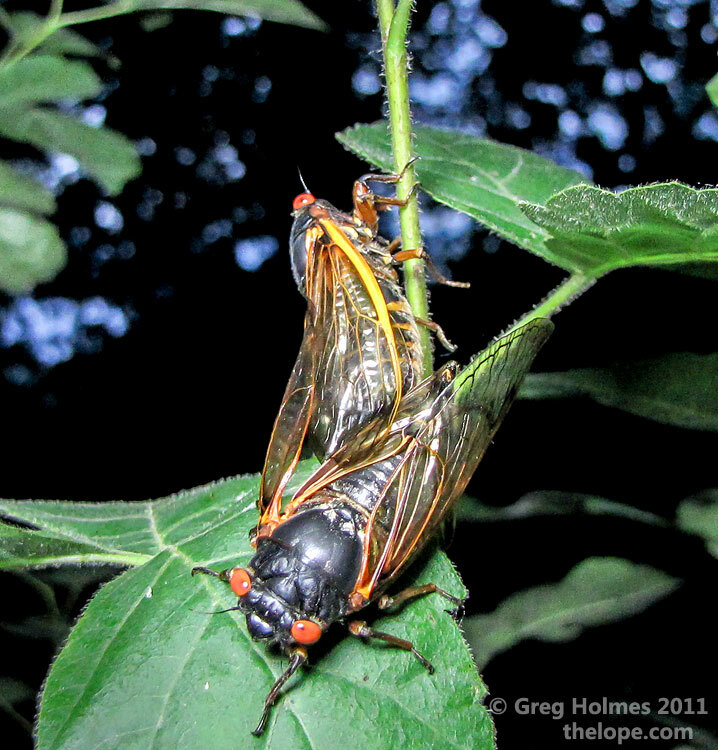 Two Magicicada neotredecim periodical cicadas of Brood XIX (13-yr) mate near Osceola, MO, on June 4, 2011. Video Link: Daddy Long Legs spider interrupts pair of mating Magicicada tredecim. 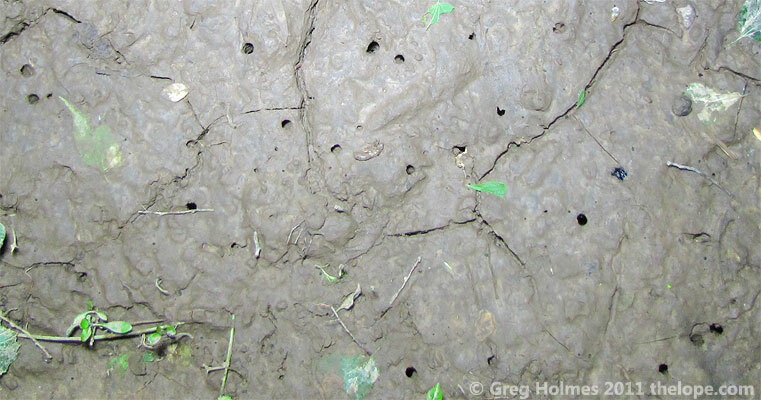 Brood XIX (13-yr) Magicicada (probably all M. tredecassini) exit holes in mud beside the White River in Buffalo City, Arkansas, on May 14, 2011. Here's a Magicicada tredecassini of Brood XIX (13 yr) calling in an outdoor screen enclosure. In the background another of the same species calls after this one does. This should give you a good idea of the sound and density of a brood made up of mostly one of the -decim species (M. tredecim, M. septendecim, M. neotredecim). In this case, a section of Brood XIX near Osceola, Missouri, was dominated by Magicicada neotredecim in 2011, with some M. cassini and M. tredecula as well. Males of all Magicicada species are capable of an alarm call. Sometimes, it will persuade a predator to let go of them. This is a male Magicicada neotredecim of Brood XIX. I shot these close-ups of Magicicada cassini specimens calling in Iowa in 2014 (Brood III). M. cassini (17 year broods) sounds the same as M. tredecassini (13-year broods). And here's a video of a Brood III Magicicada septendecim calling near Trenton, Missouri, in 2014. In the background can be heard M. septendecula and M. cassini. 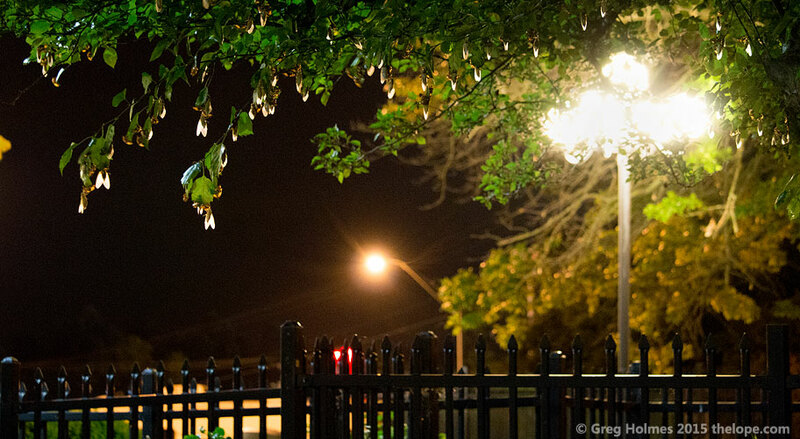 Magicicada tredecim periodical cicadas of Brood XXIII (13-yr) hang like ornaments from a tree at the Whitehaven Welcome Center and rest area in Paducah, KY, on May 18, 2015. They have all just molted and are drying and hardening. A Brood XXIII Magicicada tredecim (13 yr) dries and hardens after molting at the Whitehaven Welcome Center and rest area in Paducah, KY, on May 18, 2015. 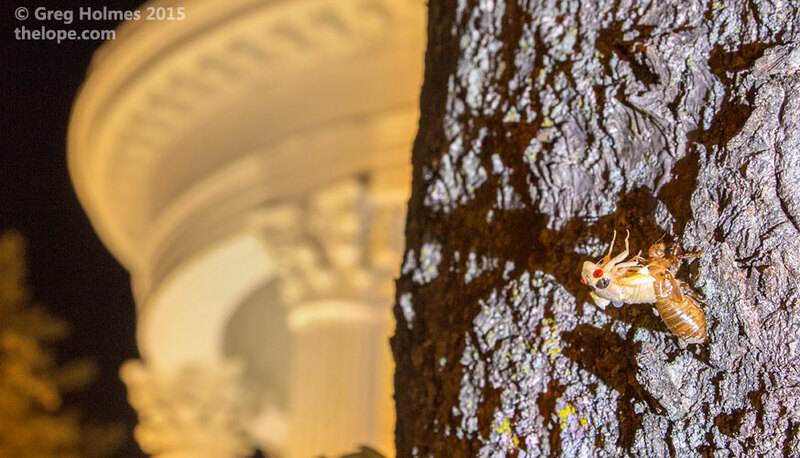 A Magicicada tredecim periodical cicada of Brood XXIII (13-yr) molts on a tree near the Whitehaven Mansion (background) at the Whitehaven Welcome Center and rest area in Paducah, KY, on May 21, 2015.. 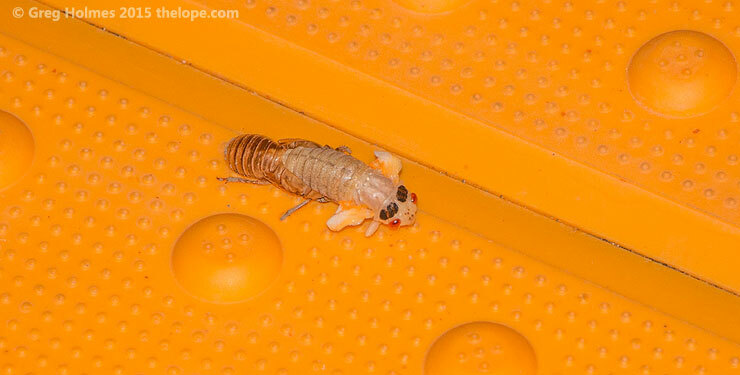 The compound eye structure is discernible in this molting Magicicada tredecim of Brood XXIII (13-yr). This was a daytime emergence at the Whitehaven Welcome Center and rest area in Paducah, KY, on May 19, 2015. I spent all night and into the following day at the Whitehaven Welcome Center and rest area in Paducah, KY, a couple times in May of 2015 photographing Brood XXIII. The location offered the advantage of not having a curfew like all of the parks in the area, which was useful as instead of an exclusively night emergence, they simply kept coming all through the day for several days and nights. Virtually ever kind of surface was used for molting. Though it was rewarding to see the true inundation of the predator satiation survival strategy, it was also somewhat of a slaughter, the predators being cars and trucks that squashed nymphs as they attempted to cross the huge parking lots and sidewalks between the grassy areas where they emerged from their holes to the trees across the pavement. The one above had molted on a rubber sidewalk ramp. Before leaving Brood XXIII I was able to record this sequence of mating call stages in Magicicada tredecim, culminating in the act itself, with an extra male trying to interfere. The specimens were on a potted tree in a bathroom - not the best studio, but it was what I had. I returned to Kansas to begin mapping Brood IV once reports on magicicada.org indicated the brood was emerging there. Brood IV is dominated by Magicicada cassini; this is an M. cassini nymph climbing a weed on which it would molt on May 26, 2015, in Mulvane, KS. Periodical cicada nymphs are the only cicada nymphs in Kansas which have the black patches and red eyes. That same night, a recently molted M. cassini pauses near its exuvium (shed skin) as its wings begin to inflate. 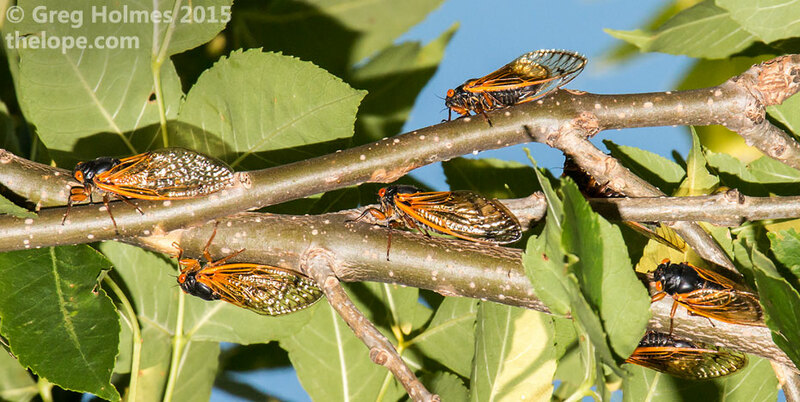 Almost all of the cicadas in that area molted in the grass and weeds even though there were ample trees nearby. They're light enough to do so without the plant falling over. David Marshall, Research Scientist in the Ecology and Evolutionary Biology department at the University of Connecticut, met me in Overland Park, KS, on June 5, where he was checking on a nymph study that would not be finished because construction had occurred in the area since the study began. 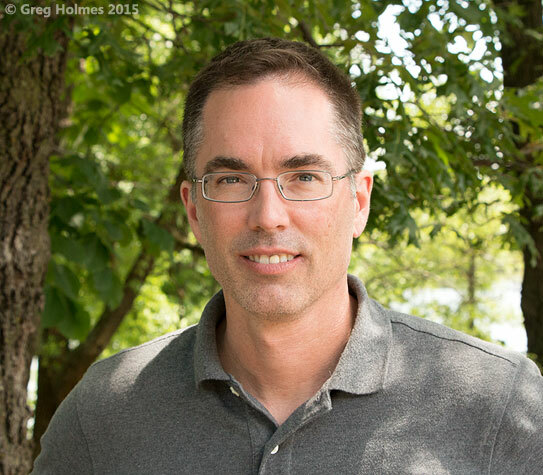 David gave me a sneak peek at research he and his wife, Kathy Hill, had done which would result a few weeks later in the publication of a paper redefining the genus to which many North American annual cicada species belong. 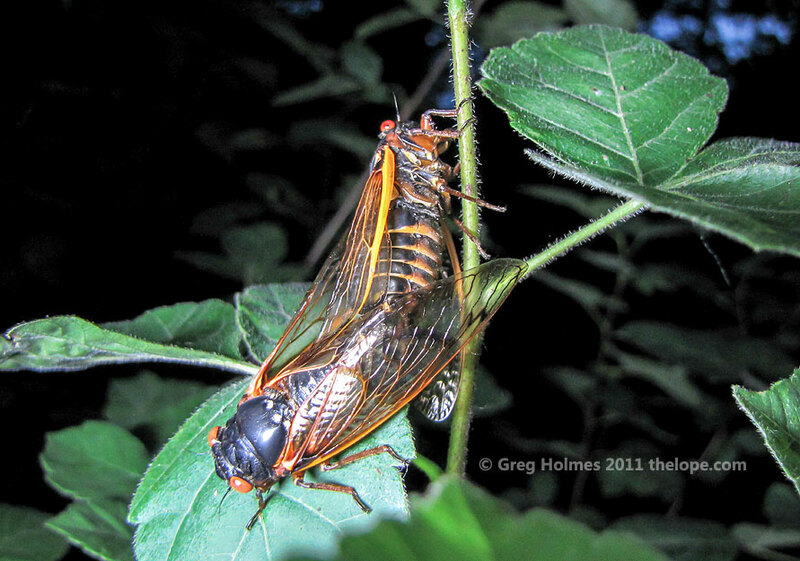 Eastern U.S. cicadas which were formerly of the genus Tibicen were reassigned to the new genus Neotibicen and western species to Hadoa. David is one of the co-discovereers of the Magicicada species, M. neotredecim. 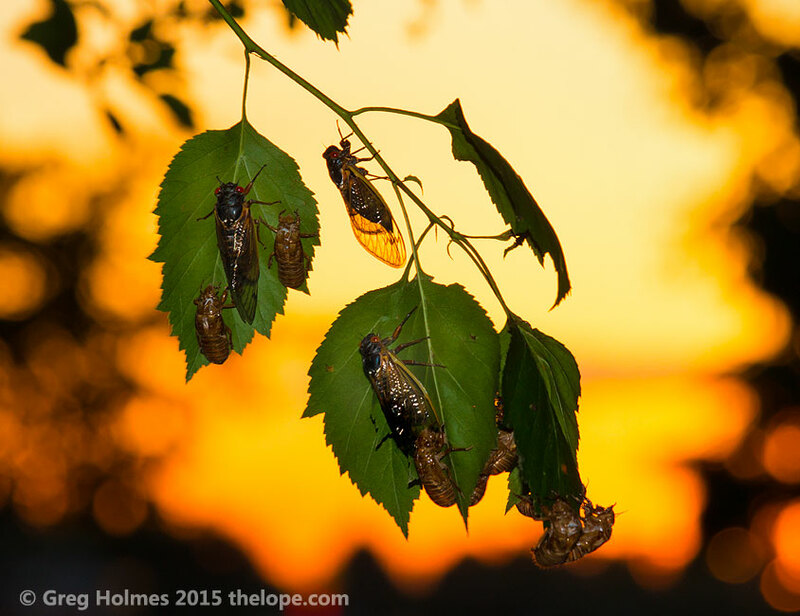 Male cicadas of the genus, Magicicada, have exposed tymbals - sound organs that vibrate. The hollow abdomen moved to alter the sound. Usually this is hard to see as it is obscured by the wing, but this male Magicicada cassini in Shawnee Mission Park of suburban Kansas City Kansas, had a defectively upswept wing which allowed this view. 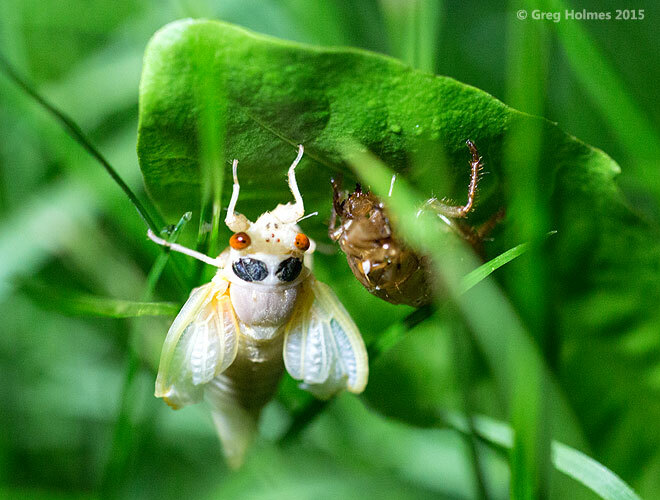 A Magicicada septendecula periodical cicada of Brood IV, the Kansas Brood, calls in Shawnee Mission Park, Kansas, on June 5, 2015. This was in the north half of the park which is in Shawnee, KS. This is the more normal, basic call. The same specimen sometimes emitted what John Marshall called the "crazy call' which is shown in another video. This specimen's wings had not formed correctly and so it was easy to work with as it could not fly away effectively, giving me multiple takes as it climbed area trees before attempting to fly and landing on nearby ground. And here is the same Magicicada septendecula specimen as above doing the "crazy call." Its purpose is unknown, last time I asked anyone who'd know. 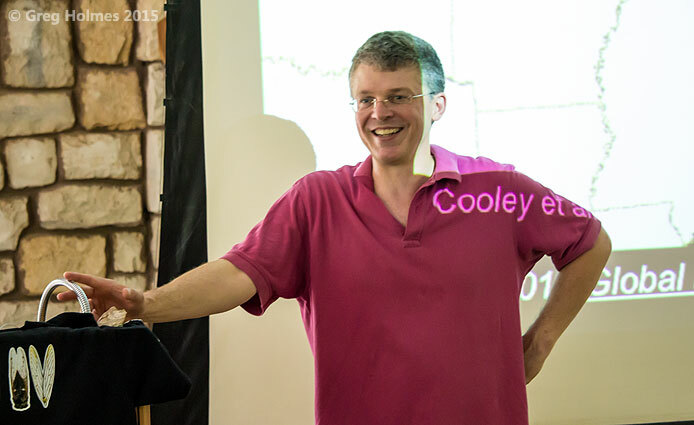 John Cooley, Professor in the Ecology and Evolutionary Biology department at the University of Connecticut, gives a presentation about periodical cicadas at the Fontenelle Forest Nature Center near Omaha, NE, on June 7, 2015. Brood IV was beginning to emerge in that area. Cooley is a co-discover of one of the seven Magicicada species and runs the information and mapping site, magicicada.org, for which I was volunteering. Part I of Cooley's speech covered cicadas in general. Part 2 covered periodical cicadas. After helping map SE Nebraska and SW Iowa, I headed to Missouri to map the part of Brood IV that abutted and sometimes overlapped parts of Brood III that I'd mapped the previous year. Then it was time to map the western border of Brood IV in Kansas. I had not expected to find them at the KS hwy 400 rest area near Beaumont, but there they were. Above and below are Magicicada cassini. A female Magicicada cassini of Brood IV, The Kansan Brood, lands on a Mimosa tree that lines a road in SW Missouri, on June 14, 2015. Mimosa flowers would not be a popular cicada perch, but a whole stretch of the road was lined with them so cicadas flying across had no other choice. I had to take advantage of the color opportunity. And this is what it's all about. A female Magicicada cassini of Brood IV oviposits (lays eggs) in a tree along Fall river in Greenwood County, KS on June 19, 2015. She uses a pointed ovipositor that swings out from her abdomen like a pocket knife to cut slits in tree branches into which the eggs are deposited. The wood fiber sticking up from the branch marks several nests she's already made trailing behind her. In a few weeks the eggs will hatch and the cicadas, each about the size of a grain of rice, will fall to the ground and burrow in. There will be much mortality underground but the survivors will undergo several stages and the vast majority will emerge in 2032. I placed a microphone just under a female Magicicada tredecim (Brood IV) that was laying eggs so I could record the sound of the ovipositor snapping back into place. Here is the range of Brood IV in Kansas; they live roughly in the eastern half of the state. The blue dots are where I, and several other volunteers, found Magicicada in 2015. The grey dots are where we found none. Where something isn't is as important as where it is when one is mapping a range. They are in Lincoln County only because they are along Mulberry Creek and the parallel Avenue A in extreme NE Ellsworth County. A small northward curve of the creek forces Avenue A and the cicada-bearing trees along it to bump across the county line into extreme SE Lincoln County. The map displaces the name for Marion County into McPherson County, where a small population existed outside the general border. Magicicada were not found everywhere in the entire range. They were only in areas suitable for their genus, which would be areas of deciduous trees, usually not too far from water.